In our experience, colour picking tends to be the most problematic aspect of the kitchen painting process for clients. What is the best colour for a kitchen? 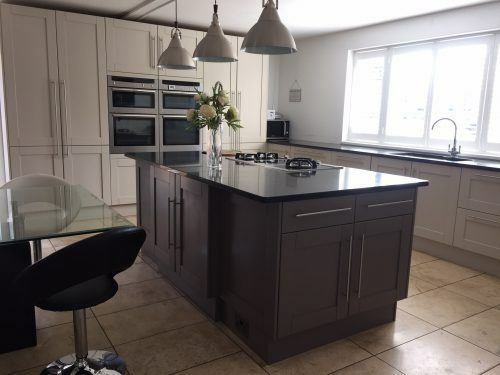 Emma Brown, Traditional Painter for Kent, has a background in interior design and was able to draw on her extensive experience to help her client finalise a colour combination for her kitchen and island. This is the end result of Emma’s insightful and calming suggestions. 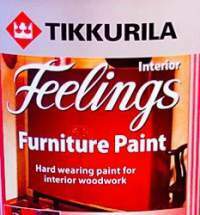 Emma was recommended by the client’s neighbour, whose kitchen she painted a few years ago. Emma requested photos of the kitchen and prepared an estimate. When it was accepted, a deposit was paid and the job was booked in. Initial Site visit – March 2018 in the Snow! Kitchen painted – July 2018 in the heatwave! It took a while for my client to decide on her colour choice. She always knew she wanted the island to be a dark, interesting colour to contrast with the rest of the kitchen cabinets. There is a very tall bank of oven housing and pantry. We were concerned not to make it too dark and imposing or too light and bland. Originally she had her heart set on a mid grey to contrast with a darker grey for the island. Greys are the colours of choice and fill the magazines still, and she was thinking of something like Pavilion Gray or Manor House Gray, both Farrow and Ball colours, or Chambers Gate by Mylands. However she couldn’t quite settle on a final choice. I suggested that the cause of her indecision was that the colours didn’t sit well against the floor. The greys were all coming up cold, with shades of blue. Looking at the other end of her large open plan room she had a large sofa/tv area. The palette that end was warm neutrals, with tall mid-dark brown/grey curtains. I felt we needed to balance the kitchen end of the room with this sofa/tv area. After narrowing the choices down, I prepared A4 colour swatches and left them stuck to various kitchen cabinets for a few days. This is a simple way to assess the influence of light, both natural and man made, on colour at different times of the day. With every hour the light falls at different angles creating different interplays of light and shade. My client happily settled on Little Greene ‘Rolling Fog’ – a beautiful neutral – with ‘Knightsbridge’ – a darker striking choice for the island. Little Greene has very high pigmented paint, so covers exceptionally well. To counteract the effects of this summer’s heatwave, I needed to add Owatrol’s Floetrol Paint Conditioner. But combined with thorough preparation and my trusted Purdy 2” Sprig Elite brushes, I still achieved a smooth finish, despite the heat! 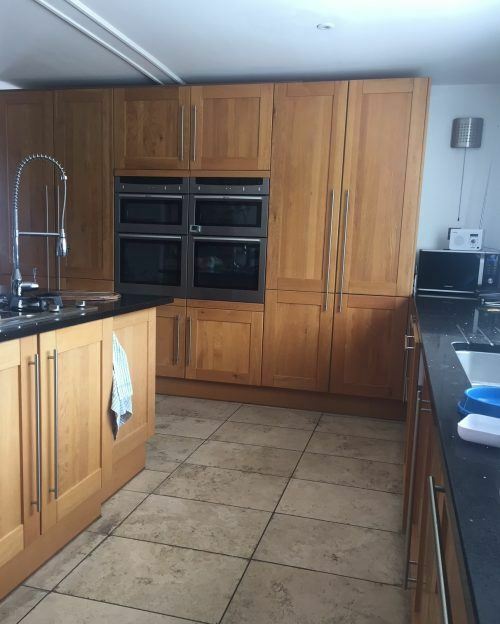 Advice on the best colour for a kitchen? The same colour picking principles apply to kitchens, or any part of the house. Every room needs to have its colour chosen individually. You need to balance the desired outcome (the colours in your mind’s eye) with the palette that is going on in the room already. I would not advise choosing a colour based on trends alone, and blindly following the fashions. Working with my client, following these principles, we reached a very happy conclusion and we are both equally thrilled with the end result. 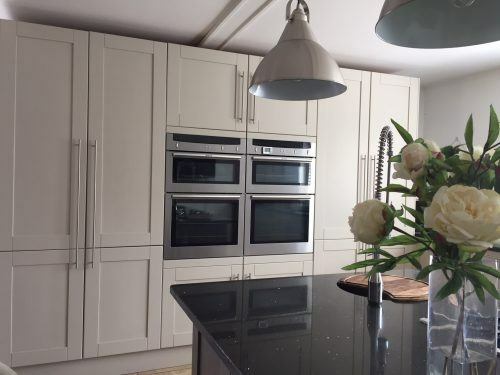 If you have a kitchen painting project in Kent, Emma can be contacted direct on her website Painted by Emma. 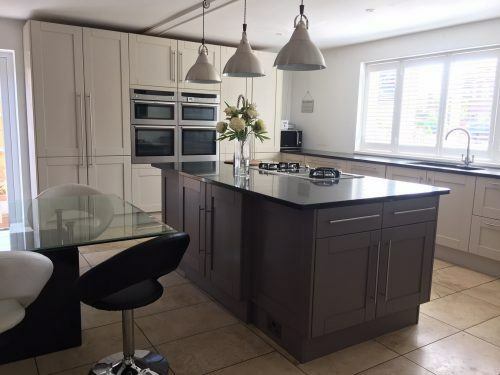 There are plenty of examples on this website too of her kitchen painting case studies. Emma is not just about expert painting and colour selection! She works closely with her cabinet maker and father, offering stylish furniture design and other modifications to your existing kitchen. 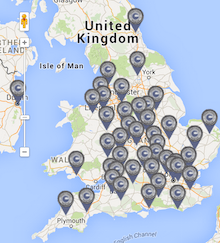 If you are outside Kent, please use the map to find your local Traditional Painter. All our members are ready, willing and able to provide the level of service demonstrated by Emma. And of course, if you want to know how to achieve this level of work yourself, use the search function throughout the website, or check out the forum to read up on the techniques and materials that work for the pros.